Peregrine Falcons - Raptor Rehabilitation of Kentucky, Inc.
"Peregrine" is derived from the same Latin root as pilgrim, meaning "wanderer," and they can be found all over the world. They have long, narrow, swept back wings that are nearly as long as their tail when folded. Falconers call them "long-wingers" because of this, and Peregrines have been used as hunting birds for many centuries. This wing design allows the Peregrine to be very maneuverable in the air while pursuing their favorite prey - other birds. The dark hood and stripes under the eyes are characteristic of falcons and help cut down on the sun's glare when chasing prey. Peregrines are the fastest animal on earth. It will soar high in the air until it spots its prey, usually a weak or distressed bird. Then it puts its wings back parallel to each other, put its head down for a fast dive called a "stoop." Their aeodynamic shape allows for confirmed speeds of between 175 and 200 piles per hour. Some films show the dive reaching speeds of up to 273 miles per hour. In a flat flight, they can fly up to 60 miles per hour. When it reaches its prey, the Peregrine flips around to strike the bird with its balled up feet. Extremely long toes allow it to grab flesh through the feathers of its prey to keep it from escaping. A special notch in the beak, called a "killing tooth" may be used to snap the spinal cord if the prey still struggles. In the wild, Peregrines usually choose a habitat with tall cliffs, and build their nests on the rocks that only accessible by air. In urban areas they adapt well to tall buildings and man-made structures such as power plants. They prefer a water source close to nest sites. Once a pair is formed, it is usually permanent and will reoccupy the same territory year after year. 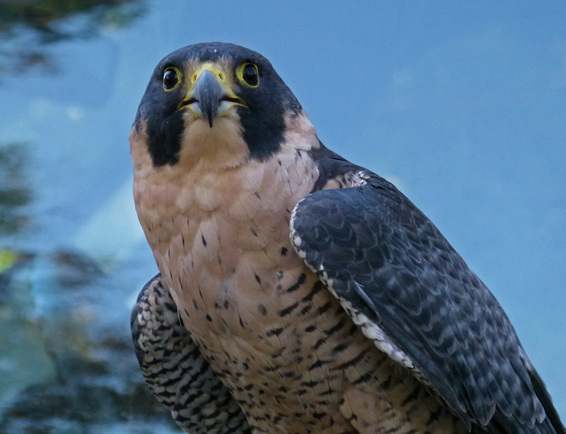 In 1962, ornithologists agreed that numbers of Peregrine Falcons were dramatically decreased. Studies showed that an estimated 7,000 - 10,000 nesting pairs in North America had been reduced to only 324 pairs, due to large amounts of DDT in their systems. DDT, an insecticide used during and after World War II, accumulated in the egg shells making them so fragile that they broke when the female tried to incubate them. Young that hatched were usually deformed. They were placed on the Endangered Species List in 1973, and DDT was banned from use in this country. 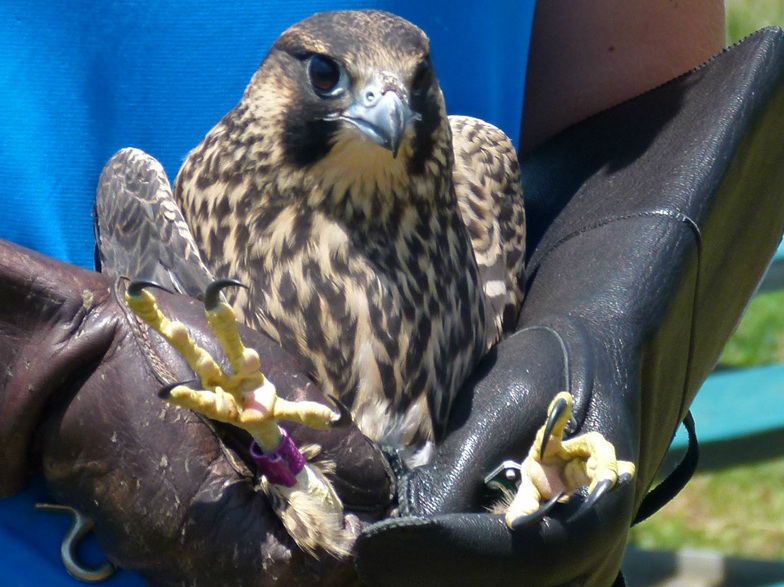 "Hacking" is the method used to increase falcon populations by the reintroduction of captive-reared chicks into the wild. In hacking programs, selected adult birds are bred in captivity. The eggs are incubated and hatched in a laboratory. Chicks three to four weeks old are transferred to a location, called a hack site, where scientists hope to establish a new falcon territory. Once there, to prepare the chicks for release, they are kept several weeks in a protective wooden box with a view of the area.Their numbers have improved and they were removed from the Endangered list in 1999. Unfortunately, DDT is still manufactured and used in other countries where the falcons may migrate. Cali was hatched in California, and as she learned to fly, was hit by a car and broke her coracoid bone. She was rehabbed and sent to a falconer for further training. She escaped from the falconer and was hit by a car again, but this time her coracoid bone did not heal correctly. She came to RROKI in 2015.